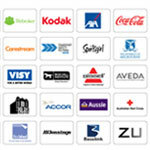 Corporate calculators are valuable personalised marketing products. 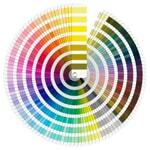 In the office, these branded office products are not only an everyday essential but they also are great for boosting brand visibility. 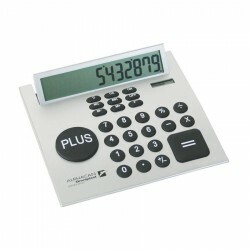 ACE’s selection of personalised calculators boasts of many stylish and functional designs. We also have budget calculators powered by water and magnetic solar calculators. 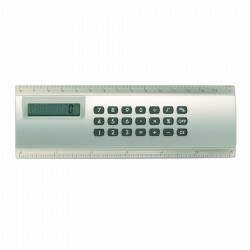 We also offer branded calculators with ruler functions. For more choices, browse the entire collection below. P.U. portfolio complete with calculator and A6 size lined pad. 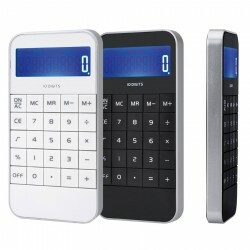 Best selling calculator with a 15cm ruler on both edges. 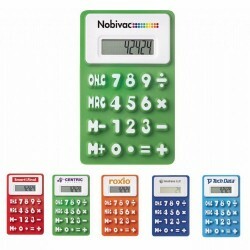 Very popular, foldable, 8 digit calculator. 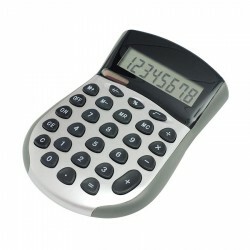 Hand held dual powered 8 digit calculator. 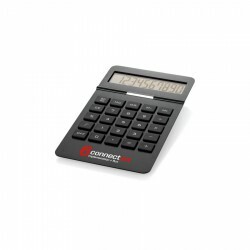 Desk top calculator with a unique new promotional twist. Large rubber buttons with large branding potential. Boxed. H2O powered calculator, simply refill with water to recharge! Boxed. 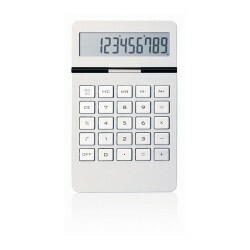 This stylish silicone calculator can also be used as a small writing board for quick messages. 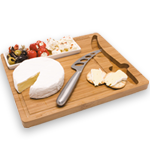 Just turn the item around and write your message on the mini white board (black marker included). The 10 digit calculator works on battery and solar panel. 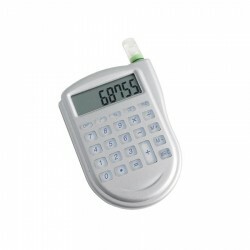 10 digit dual power calculator, Black face with white trim, Large display. 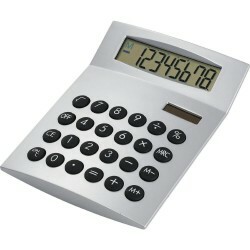 Matt silver desk calculator, Dual powered with raised rubber keys, Large display, Supplied in silver box. 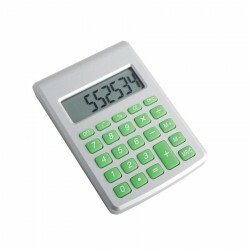 2-in-1 calculator front with maze puzzle back. 10 Digit *Dual power, Batteries included. 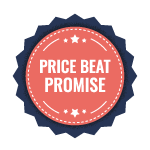 3 fold unbleached cardboard cover with compact 8 digit battery/solar calculator, blocks of 6 coloured noteflags, and sleeve to store cards, notes, coins, receipts, dockets. 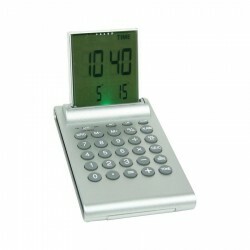 Zinc alloy body, multi function LCD desk calculator with unique 4 colour changing display, calendar, alarm clock, 12/24hr display and temperature. Includes 2 x AAA batteries. Boxed. 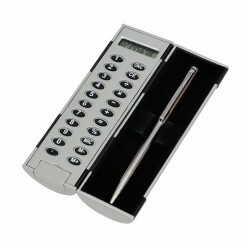 Eight digit calculator in rubber touch plastic case. Boxed. This case can be rotated six times, creating an optical illusion. 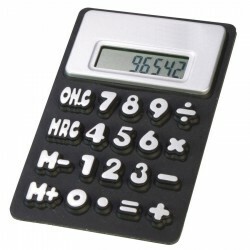 Supplied with a metal pen, 8 digit calculator. Boxed. 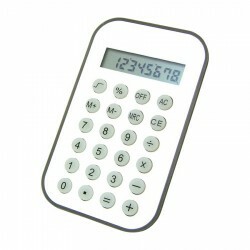 Silicone flexible calculator with white metal frame around display and large raised numbers. Battery powered. 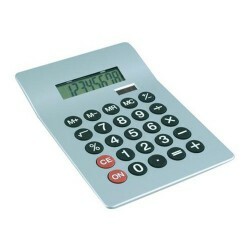 PVC pad with calculator, notepad, and small twist-action pen.